Collagen is a structural protein found within the body, responsible for giving our skin its structure and elasticity. The body naturally produces collagen, however our ability to produce collagen declines with age, contributing to loss of skin structure, which in turn leads to fine lines and wrinkles. Collagen is found within the dermis, or ‘middle’ layer of skin, along with elastin, another protein that provides elasticity to our skin. Collagen and elastin are important as they allow skin to ‘bounce back’ and retain shape when moved or stretched. Collagen is not only found in the skin, it’s also in other connective tissues within the body, such as our bones, joints, and muscles. Collagen could even be seen much like a glue that helps to hold our body together. Collagen is also a building block of your hair, nails and teeth, along with another fibrous protein, keratin. While natural body ageing slows our collagen production, other lifestyle factors like poor diet, smoking, pollution, and UV exposure can also contribute to depleted collagen levels. 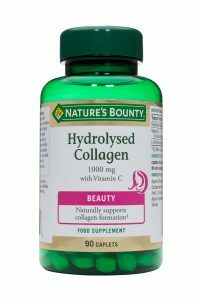 Is collagen different from gelatin? Gelatin is derived from collagen — when collagen breaks down, it becomes gelatin. As we know, bones are loaded with collagen, so when making bone broth for example, and as the bones simmer in broth during the cooking process, the collagen slowly breaks down into gelatin. So essentially gelatin is full of the same stuff as collagen, just in a different form. Gelatin was in fact one of the first foods used as a remedy in ancient Chinese traditions. Where does collagen in supplements come from? Collagen is typically derived from animal sources as it is a naturally occurring protein present in animals’ bones and cartilage, as well as being present in our own bones and cartilage. When it comes to sources of collagen in our diets, the main ones are foods very high in protein, including chicken and fish. And what does hydrolysed collagen mean? Hydrolysed collagen is a form of collagen that’s more easily absorbed by the body. When you ‘hydrolyse’ collagen, the collagen is broken down so the peptides become more bioavailable, meaning they are a form that is easier for the body to absorb. Vitamin C is a vital partner for collagen – this is because the body uses vitamin C to convert collagen into a useable protein. Vitamin C contributes to collagen formation in the skin and the rest of your body. For collagen to be best activated in the body, it’s always better to take your collagen supplements with a source of amino acids and vitamin C.
Beauty from the inside or outside? Collagen is a rather large molecule, too large actually to be absorbed and pass through the skin. To get the benefits from collagen, it should come from within. When taken as a supplement, hydrolysed collagen is absorbed into the bloodstream as free amino acids and small collagen peptides. They are distributed through the body and into the dermis via the network of blood vessels. In the dermis the collagen peptides stimulate the production of collagen and elastin, which then gives you the benefits. At Nature’s Bounty®, we understand the world of health and wellness can often feel complicated and confusing, and we are here to help. We’ve developed a supplement range with colour coded benefits, helping you to find the right supplement for your needs. From beauty and women’s health, to energy, relaxation and more – we’ve got you covered to find the right supplements to reach your healthy best. 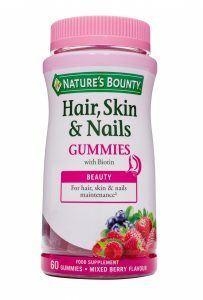 Our high strength Nature’s Bounty® Hydrolysed Collagen 1000 mg with Vitamin C helps to keep skin looking fresh, radiant and toned1, while our best-selling Nature’s Bounty® Hair, Skin & Nails Gummies with Biotin provide collagen, zinc and biotin, and are a delicious alternative for those who don’t like swallowing pills.